Russian consumers are bearing the brunt of the Kremlin's answer to EU sanctions. Despite promises to stabilise food commodity markets, food prices have risen sharply over the past three months, affecting all strata of Russian society. When last August, Prime Minister Dmitry Medvedev banned all imports of fresh produce from Europe for one year, stopping imports of beef, pork, poultry, meat, fish, cheese, milk, vegetables and fruit from the 28-member European club and others involved in anti-Russian sanctions, including Australia, the US and Canada, the intention was to answer fire with fire. But the unintended consequences of such a radical decision were immediately apparent from the outset: despite promises to stabilise food commodity markets, food prices have risen sharply over the past three months, affecting all strata of Russian society. According to the Economist Intelligence Unit (EIU), over the past four months, the price of meat and meat products increased by almost 17pc in Russia compared with the same period last year. Moreover, the ban is potentially very troublesome for Russia's burgeoning hospitality industry, which has grown exponentially over the past decade. Many prestigious EU brands and products, such as luxury Parmiggiano-Regiano cheese from Italy and premium Charolais beef and Bresse chicken from France, had become regular components of restaurant menus across Moscow and beyond. The top end of the hospitality market seems to be weathering the storm with quintessential Russian resilience. Indeed, some even view the ban as an opportunity as much as a financial and logistical headache. 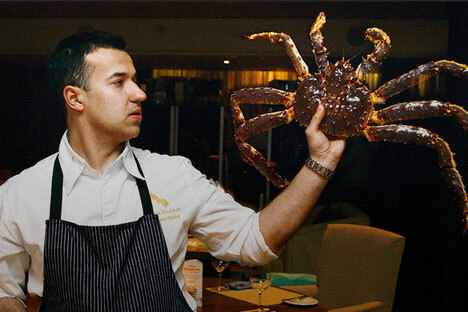 Martin Repetto, chef at the Radisson Royal Hotel in Moscow, takes a sanguine view. “I think the ban is a good opportunity for the local suppliers to grab some market share,” Mr. Repetto said. Vladimir Mukhin is the owner and head chef of Moscow’s trendy White Rabbit restaurant. He says that the ban has not significantly affected his business, although he concedes that prices have risen as a result. “We started working with local producers long before the sanctions, so I cannot talk of any tremendous damage. Outside of Moscow, the sector appears more reserved in its assessment of the embargo’s effect on its businesses. A management executive of a plush St Petersburg hotel, who did not wish to be named, explains that, for starters, although European products are still available in Russia, they are only for those with sufficiently deep pockets. “After the sanctions were announced, it took a while until it really affected the availability on the market,” he says. The question of the rouble is, indeed, a vexed one. “It was not even the impact of the embargo but the rouble rate as it is,” said Deputy Prime Minister Arkady Dvorkovich recently, fixing on the plummeting rouble – caused largely by the dramatic fall in the price of oil – as the main cause of Russia’s economic woe. Rouble rate notwithstanding, like his counterparts in the capital, the St Petersburg hotel manager is looking at South America and, of course, above all Russia to supply enough produce for the hotel’s signature restaurant. In recent months finding new supplies of essential items has been a top priority for Russia's political class. Sergei Dankvert, head of the government’s agricultural agency Rosselkhonadzor, held meetings with diplomats from several Latin American countries in August, to discuss replacing European imports of chicken, beef and other food items. None the less, some commentators aren’t convinced that simply getting into bed with new trading partners is a sustainable solution. In 2013, Russia imported $6.7bn (£4.3bn) worth of meat and meat products in total, with more than 20pc purchased from countries now on the blacklist. The sheer volume involved raises the question of whether Russia can realistically plug such a massive supply gap. “There is potential to source products from other parts of the world, in addition, of course, to domestic suppliers. In August the Brazilian government authorised 90 new meat plants to begin exporting to Russia,” says EIU analyst Alex Nice. “All of these options are likely to be pricey and the costs for the hospitality industry have risen significantly," he adds. He also says the embargo is likely to have more impact on both consumers and businesses catering to the lower income segments of Russian society. Premium restaurants and their clientele have the resources to cope more easily with the price rises due to the costs of importing products from further afield. Many Russians and Russian businesses do not. The country must now brace itself for a potentially dramatic fall in living standards, with the danger that some consumers will be priced out of the market for certain goods. However, if the combination of domestic Russian producers and other non-embargoed countries can manage to appreciably increase supply as the authorities claim, then prices may stabilise in the mid to longer term. “The simple reality is that food prices will continue to rise for everyone, and that will contribute to a decline in real incomes,” Mr. Nice concludes. There are also concerns from some quarters that the ban may extend to alcoholic beverages. Such a move would be disastrous for the country’s nascent food and drink industry, as importers and retailers in Russia have made a lucrative income from distributing and selling premium international wine and spirit brands.